Over the past two weeks San Diego mailboxes have been flooded with mailers attacking Mayoral candidate Bob Filner from a group calling itself a committee called California for Small Business,” sponsored by the Neighborhood Market Association.” A quick visit to the group’s website confirms that OB’s Apple Tree Market is an active member of the group, with a video featuring the OB location on the front page of their website. 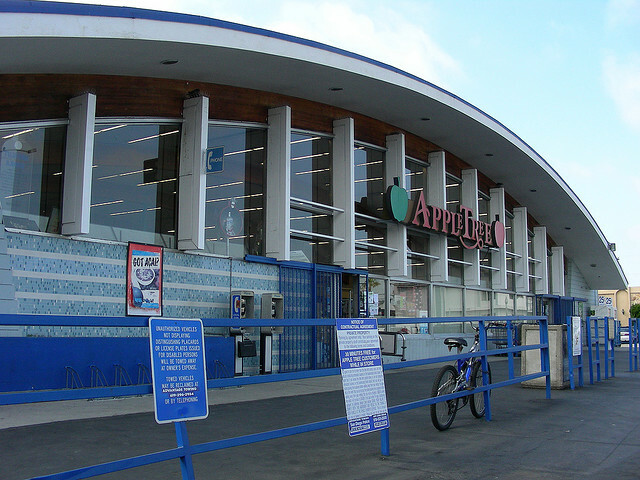 It is basically the only supermarket within walking distance for many OB residents. Hatin' On Congressman BobOne anti-Filner piece features uncomplimentary photos of the Democrat, describing the congressman as a "bully" and references an "obscentity-laden" outburst. That outburst, it turns out, was directed at Veterans Affairs officials after they failed to take steps in 2006 to protect 26.5 million military personnel whose personal information was stolen from the VA. The exchange went like this: “You guys f--- it up,” Filner declared. “Stop covering your a- and figure it out.” The California Democrat said millions of military personnel are “scared to death” that their identities might be stolen. Another mailer has a grainy photo of the congressman in front of the Capitol, labeling him “out of touch” and implying that he did favors for donors. Yet another, sent to addresses in North Park, University Heights and Hillcrest, suggests that Filner is anti-gay. Filner has admitted that his position on issues relating to sexual orientation has evolved over the years, and is now counted upon as a reliably pro-gay congressman. Two years ago the Neighborhood Market Association and two of its campaign committees paid a total of $14,000 in fines for failing to properly reveal their identities in political mailers they put out attacking the San Diego booze back in 2008. The group is aLa Mesa-based trade collection of liquor stores and markets run by Mark Arabo, a well known Chaldean Christian leader. Last October he met with President Obama calling upon him to put a stop to “ethnic cleansing” Arabo alleged was occurring in Iraq against Chaldeans. I wonder what the Neighborhood Market Association’s logic was? Do they have legitimate grievances with the Congressman? Are they being paid to send these? Did anyone try to contact them? I called to find out. Hopefully they will get back to me. The San Diego Reader recently had a story on Mark Arabo’s campaign against Bob Filner. No, Arabo doesn’t have”legitimate grievances” with the Congressman. As I recall, Arabo’s group bankrolled the huge (unsuccessful) push to keep booze on the beaches of this city. Anybody in OB who reads this ought to let Neighborhood Market know you don’t like mixing your produce with Arabo’s politics. “As I recall” the main forces behind Prop D were wealthy property owners in beach area zip codes who sought to drive their property values up by driving away the “riff raff” (alcohol) from their area. Tourism is San Diego’s number one industry and the number one attraction is our beaches. Why did we think it would be a good idea to introduce a reason to stay away from them? So while you may be one of those who is thrilled that last fourth of July or this past Memorial Day weekend you could drive right into dog beach parking lot most of the day and pick from a dozen parking spots, those folks who have to earn their living providing services to tourists can just eat cake, right? I don’t know what drives the owners of Apple Tree to hold their position but it’s been my experience that the owner is a good person who cares about OB. And I think the booze ban has been BAD for our city and caused revenues to be significantly reduced. So if I’m picking sides on this one, the issues you raise are not getting the job done here. This seems to be a fault with politics today. We’re more concerned over Bob Filner’s stance on gays or ethnic cleansing in Iraq than what he’s going to do to make the lives of Obecians more happy and prosperous. I’m back. Specifically, that Reader story was by Matt Potter on May 29, 2012. Arabo and his outfit are supporting Nathan Fletcher for Mayor. No surprise there. Personally, I wouldn’t buy chewing gum at the Neighborhood Market. What does the flier mean that Filner ‘didn’t have time to vote for you’– is Filner also accused of missing legislative votes (a la the attack on Fletcher)?